Updated: Naser Abdo, who now sullies the name of dissent. This came up on a Google Image search for "conscientious objector." BIG problem. At the very first wave in February Ghanim Khalil, a young Marine who had already served for four years at the Parris Island supply depot, had found his way to the podium among the 500,000 crammed into the New York City demo to shout that he would resist all efforts to deploy him. After he said his piece, Khalil received a warm hug from David Cline, formerly of the Vietnam-era Oleo Strut, who’d retired from 20 years at the post office and become the full-time President of Veterans for Peace. The case raises far more pressing issues than my book, of course. GI counselors everywhere are wondering if they could have misjudged someone like Abdo, thinking he might be another dissenter of integrity like Ghanim Khalil. In one Facebook discussion, Gulf War vet Jeff Paterson, said what most of us feel: “I would rather err occasionally on misreading someone’s future intent than to not help someene who needs it.” Still, it’s hard not to feel betrayed, and many expressed that in that same discussion. The mission of the advocates is, of course, somewhat different from mine, and yet the same: to see clearly and tell it with conviction. To the extent that Pfc. Abdo’s actions make it harder for anyone trying that for themselves or someone they know, it hurts us all. I think we need to offer the alternative vision. Update: Iraq Veterans Against the War has issued a statement about Abdo, which I’m reproducing below. It’s going to take all of us to push back against people’s preconceptions. Abdo is not now and has never been a member of Iraq Veterans Against the War. In August 2010, IVAW supported his application for Conscientious Objector status to reflect our commitment to protecting G.I. Rights for all service members and access to a fair C.O. application process in accordance with Army Regulation 600-43 andDoD Directive 1300.06. In October, IVAW publicized a statement by Abdo condemning Islamophobia. Finally, in November 2010, Abdo offered his support at Ft. Campbell to SPC Jeff Hanks, whose own battle with combat-related trauma earned him the support of IVAW’s Operation Recovery Campaign. 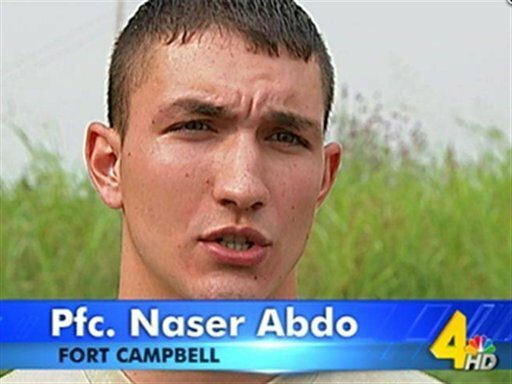 IVAW has not been in contact with Naser Abdo since that time. As we await additional information on the details of Abdo’s arrest, IVAW reiterates its commitment to non-violence, as outlined in our 2009 Resolution on Non-Violent and Peaceful Actions. Per the organization’s mission, IVAW supports the health and safety of all American troops, and never condones the threat or use of violence against military or civilian establishments or individuals.